We Do the Prospecting and Pre-Qualifying. You Do the Relationship Building. While Blue Coast's expert analysts and support staff help you do the lead-generation work, you manage all the client relationships and enjoy the recognition and appreciation that come with being a savvy business consultant. As a Blue Coast Savings Consultant, you'll benefit from extensive product training and support—all backed by our high tech "Business 2.0" marketing systems—plus we supply pre-qualified, set appointments in the area of your choice. Get on the Right Side of the Economy with Blue Coast! The recession is taking its toll on the American economy with bankruptcies up 28%, home foreclosures up 60%, consumer confidence down 40%, and the highest unemployment rate in 2 years...yet Blue Coast is experiencing a 160% increase in business during these times! Why? Because our job is saving businesses money! Companies always need to work to keep their bottom line in the black and that is true now more than ever. Our suite of financial services allows businesses to recover monies they have overpaid and save money going forward, each and every year. You may already be a business management consultant, accountant, financial planner, insurance provider, or mortgage broker. You may already own your own business. You may be in corporate America with a dream to be your own boss one day. If accepted, adding the title of "Blue Coast Savings Consultant" can deliver the kind of business opportunity, financial rewards, and independence you've been seeking. Blue Coast Helps You Build Your Business - and Income - Exponentially. We are a company that opens up new markets and therefore we have no saturation. You get paid for offering the largest and most impactful services in America. But more important, we've created one of the most synergistic suites of 15 essential business-to-business services in the marketplace. And because this suite offers such superb value—and remarkable savings—it can actually transform one prospect into a dozen within the same company. But best of all, as a Blue Coast Savings Consultant, you can offer this innovative suite of 20 risk-free, no-cost financial services to a wide range of businesses—both large and small. Making money as a Blue Coast Savings Consultant is as simple as one-two-three. Because we've assembled a compelling combination of innovative get-you-in-the-door financial services that delivers the dramatic savings prudent businesses simply can't resist. What's more, Blue Coast's extensive portfolio of risk-free services is also designed to provide you with multiple relevant services per client, which equals sizeable and lasting returns—plus tons of referrals. Which means, in addition to the steady supply of pre-qualified appointments you'll receive from Blue Coast, you can also count on plenty of additional referrals from a roster of satisfied clients-for-life. Did you know that 90% of all Workers Compensation policies contain errors and 60-80% of U.S. companies overpay their premiums? Blue Coast works with the country's largest Worker's Compensation recovery company to offer FREE no-risk workers compensation insurance policy analysis to your clients. Blue Coast Savings Consultants keep 20% of the recovered monies. Blue Coast's team tax professionals, structural design experts and engineers enables us to properly identify and classify building component expenses to maximize the tax benefits generated by a Cost Segregation Study—allowing you to provide your with clients the maximum cash benefit they legally deserve. With over 18 years of industry experience in the area, Blue Coast allows you to capitalize on what many consider the hottest commercial real estate opportunity in America. In an exclusive arrangement with Blue Coast, the world's largest energy provider—and 90th largest company on the planet—all electric energy contracts submitted by Blue Coast Savings Consultants on behalf of their clients. This partnership enables Blue Coast Savings Consultants to not only beat existing electric energy contracts but, on average, cut their clients' energy costs in half over the life of the contract by via reasonable long-term rates. The commissions for Blue Coast Savings Consultants are the largest in this industry—by a ratio of 6 to 1. Best of all, as a Blue Coast Savings Consultants, you'll be paid up-front on these 5-year contracts with no charge-backs—ever! Blue Coast is also an innovator within the equipment leasing industry. We provide you with qualified leads, vendors that already have clients as well as with top-notch lenders that are ready to go from the day that you start. Cashing in on this $270 billion recession-proof industry and capturing residual income has never been easier! Help your clients capture all the dollar-for-dollar tax credits that they're entitled to by law. Efforts to make a product lighter, cheaper, more durable or develop more streamlined production or processes may qualify for a credit. It's not just for high-tech or bio-tech businesses anymore. Each one designed to help get you in the door, have a positive impact on your client's bottom line, and help pave the way for multiple sales in areas of service that include: Equipment Service Contract Reviews & Reductions, Physicians Prescription Programs, Energy Efficiency Studies, and more! Bottom Line: There's Blue Coast - Then There's Simply Everybody Else. If you've researched other similar business opportunities, you know that it's not uncommon to pay $40K to $60K for the right to represent just one product. Often, ongoing royalty fees must also be paid and no marketing support is provided. Not so with Blue Coast. Instead of requiring an exorbitant upfront investment, limiting your opportunities and requiring you to do your own marketing, Blue Coast provides 20 risk-free, high-demand services, comprehensive marketing support plus an ROI that few others can claim. The desire to be your own boss. The ability to manage business relationships. The passion to be successful. Blue Coast will provide you with everything else you need to successfully own and run your own financial services company. You'll receive the best training available in the industry—from comprehensive product materials and Web-based seminars to convenient one-on-one business training sessions with your own Blue Coast success coach. Give Blue Coast a Thorough Look Before You Give anyone Else a Check. For a limited time, you can have your own Blue Coast business, offering all of our in-demand services, for just $19,995! Why is Blue Coast's fee smaller than most? Because we don't believe in overcharging our Blue Coast Savings Consultants when they could use that money to help build their own businesses. So join a team of world-class professionals at the top of their game. Work full-time, part-time, or flex-time. Even work from home, if you like. And take advantage of one of the most comprehensive, compelling and rewarding business-to-business opportunities available in America. Build A Sales Force For No Additional Cost—We'll Even Train Them! Smart Marketing" & "Marketing-in-a-Box Systems"
Blue Coast Financial is a Licensed and Registered business opportunity. 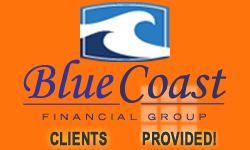 Blue Coast is not registered and/or offering opportunities in CT or OK.
Click on Request Information for FREE info on how to open a Blue Coast Financial Group franchise today! Please Note: This Blue Coast Financial Group franchise opportunity and other franchise business opportunities, businesses and franchises for sale on this web site are not to be considered as an "offering", "franchise offering", suggestion or recommendation by Franchise Leader™. This advertisement depends entirely on the truthfulness of the information provided by our advertisers which includes, but is not limited to, franchisers, franchise brokers, franchise consultants and business brokers. Franchise Leader™ recommends that you consult a lawyer, financial consultant, accountant or professional advisor before buying a franchise or business opportunity or any type of business. By using this form or any part of our website, you have agreed to all terms and conditions of Franchise Leader™. Please review our Terms & Conditions for more information.